Icarus has developed a new 8 inch e-reader and they are hoping that it will find commercial success. In order to make this device more accessible to people living in North America they have just listed the latest device via Amazon for a very respectable $199. The Illumina XL e-reader features an 8 inch capacitive touchscreen display with a resolution of 1024 x 768. Icarus decided to employ E-Ink Pearl technology because the higher resolution e-Ink Carta screens aren’t compatible with 8 inch devices. One of the most compelling features of this e-reader is the fact it is shipping with Android 4.2. Users will be able to install mainstream e-reader apps like Kindle, Kobo, Nook, Skoobe , Bliyoo and hundreds of others. 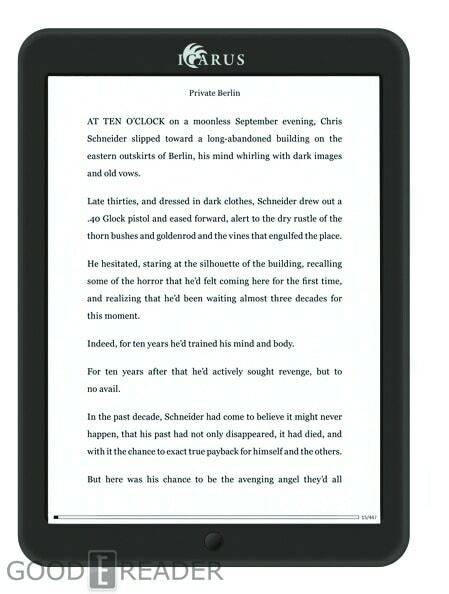 The vast majority of e-readers on the market are six inches and many people want the extra screen real estate in order to get novels or PDF files. Icarus is well known for larger screen devices and has been developing 9.7 Android e-readers for a number of years. Looking forward to see a review for this e-reader on your YouTube channel.